The 5th annual IGRF-NW calendar fundraising event begins Monday, November 14th at midnight. This beautiful calendar is produced for 2017 featuring our very own Pacific Northwest iggy(ies). This has been an unprecedented year for releases, and many are seniors or have had serious health issues. Your generosity will help insure these little guys and gals get the care they need. All the proceeds from the calendar are used to pay for medical and other expenses for the rescued Italian Greyhounds here in the Pacific Northwest. Many rescue pups benefited from our fundraising this year including Perseus, Jerry, and Addie to name a few. And, did you know that all of our fosters are now micro chipped because of your generosity? We want to ensure that if a dog gets lost, we can find him or her. Once in awhile a rescue comes in who needs special medication or a medical test that the national organization can’t pay for—but your donations make it possible. In addition to the Iggy of the Month photo auction, you may purchase calendars, advertising space for your business or avocation ($25), or a "head shot" space for your iggy's birthday or other special date ($10) below. Calendars are just $20 each and shipping is free! Thanks so much for your support! We also have some free spots available interspersed throughout the calendar, so if you'd like to send a head shot of your IG for the calendar, please email it to igrfnw@gmail.com and note that it's for the "free photo spaces". We will auction off a "photo of the month" over the next couple of weeks, and then we'll auction the cover! Imagine your IG as Iggy of the Month. 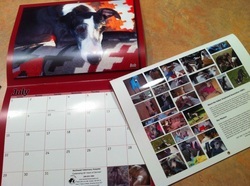 These are beautiful, full color calendars the benefit rescued IGs. Auction winners receive a free calendar. Come to this page for the links to the Iggy of the Month auctions.